Enlightenment for the Blind needs your help! Enlightenment for the Blind is a 501(c)(3) non-profit organization serving the blind and visually impaired, that publishes educational materials to help them live a happier, healthier, and more meaningful life. 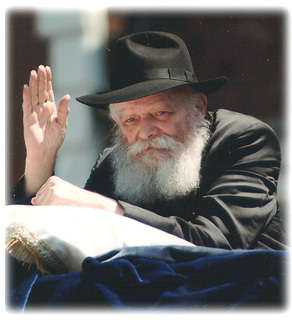 Since 1992, Enlightenment for the Blind has been disseminating the teachings of the Rebbe, Rabbi Menachem M. Schneerson, of Lubavitch, to the Jewish Blind and visually impaired Jews, on how we can all prepare ourselves and the world around us for the coming Redemption by Moshiach, through increasing in acts of goodness and kindness. Even though there are many organizations around the world, that are dedicated to serve the needs of the blind and visually impaired, Enlightenment for the Blind is the only Jewish charity that publishes a weekly Torah digest for the Jewish blind and visually impaired Jewish people. This wonderfully inspiring weekly publication, called, Living with Moshiach, is based on the deepest hidden and revealed wisdom of the Torah as taught by the Rebbe, Rabbi Menachem M. Schneerson, of Lubavitch, and is available free online, and free by mail, in large type or braille formats, for all the blind and all visually impaired people. Living with Moshiach is a lively compendium of deep Torah insights from Chassidic sources and the Kabbalah, and detailed guides for the Jewish holidays and meaningful Jewish observance. Enlightenment for the Blind also hosts an extensive archive of Jewish resources on the weekly Torah portion, Jewish holiday guides, Chassidic stories, and books, explaining the concept of Moshiach and the coming imminent Redemption, in many different languages. All of the services and publications of Enlightenment for the Blind are free of charge to all the blind and all visually impaired people. Visit: The Library of Congress - Services for Blind and Physically Handicapped Persons. Visit: Chadish Media - Audio Tapes - Teach Yourself Judaism & Learn to Read Hebrew. The Daily Sicha (Audio) - Listen to selected excerpts of the Rebbe's Sichos [talks] which are relevant to the particular day. Visit: TruePeace.org Dedicated to educating the public regarding the current situation in Israel, based on Torah sources, with special emphasis on the opinion and teachings of the Lubavitcher Rebbe. Lubavitch Shluchim Conferences On The Moshiach Campaign, Committee For The Blind.